The tattooing practised across Polynesia developed unique forms in New Zealand, with deeply grooved scars and spiral motifs. While facial moko became less common after European settlement, from the late 20th century there was a renaissance of both the full-face moko worn by men and the moko kauae (chin tattoos) of women. Tattooing is common throughout the Pacific Islands. In New Zealand, Māori developed techniques to cut deeply into the skin, producing grooved scars. The spiral motifs are distinctively Māori. Moko originated in rituals of mourning for the dead. Women would haehae (cut) themselves with shells or obsidian and put soot in the wounds. In tradition, tā moko was brought from the underworld by a chief called Mataora, who married a tūrehu (spirit) called Niwareka. She fled to the underworld after he hit her. He followed and was taught tā moko techniques by her father, Uetonga. The pigment used in tā moko was usually made from charcoal mixed with oil or liquid from plants. Known as wai ngārahu, it was stored in special containers. Uhi (chisels) for tattooing were traditionally made from the bones of sea birds. 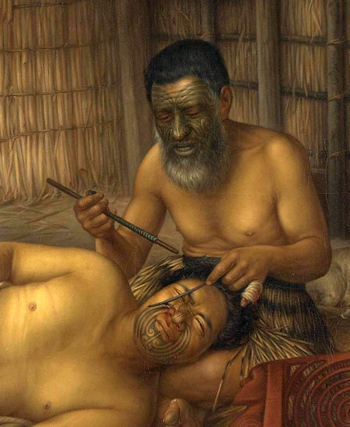 Māori also had comb-like instruments for putting pigment into skin. Metal chisels were used after European arrival, and by the First World War needles were used. From the later 20th century most tattooists used tattoo machines. The process of tā moko was highly skilled, and tohunga tā moko (tattoo experts) were greatly respected. They were paid with treasures such as weapons, cloaks and greenstone. The process was very ritualised and tapu (sacred), and the person being tattooed was fed using a special funnel. Moko represented a person’s mana (status), and some chiefs who signed the Treaty of Waitangi reproduced their moko as signatures. However, some people of very high rank were considered so tapu that they could not be tattooed. During early European settlement, preserved tattooed heads were sold as souvenirs and collectors’ items. Māori with moko were sometimes killed for their heads, leading to a decline in the practice of tā moko. Some Māori killed their slaves and then tattooed them. These heads, called mokomōkai, were sold to overseas museums. From the 1980s many mokomōkai were brought back to New Zealand. Māori women continued to receive moko kauae (chin and lip tattoos) into the 1950s. From the 1970s Māori gang members wore moko as part of their gang insignia. From the 1980s the Māori renaissance encouraged tā moko as a way to express Māori or tribal identity.